Tanzania-focused oil and gas exploration company Swala (DSE: SWALA) recently announced that it has been working closely with the Tanzania Petroleum Development Corporation (TPDC) to ensure that the Kito-1 prospect in the Kilosa-Kilombero valley in Morogoro could be drilled in 2017. At the beginning of February 2017, Swala and TPDC carried out a joint program to inform on the planned drilling program and update the local communities around the drilling area. On February 9th, 2017 TPDC confirmed that the Ministry of Energy and Mines of Tanzania has extended TPDC’s license rights over the Kilosa-Kilombero area for a further 12 months (the license´s first extension term expires on February 20th, 2017). TPDC in turn required the contractor parties (Swala, Otto Energy and Tata Petrodyne) to provide financial guarantees covering the minimum well commitment before it extended the Production Sharing Agreement (PSA). Swala explains that these guarantees required under the terms of the 2012 PSA cover minimum commitment obligations of USD6m and can be drawn down as the drilling program progresses. These conditions must be satisfied by February 20th, 2017 when the license´s first extension term expires. 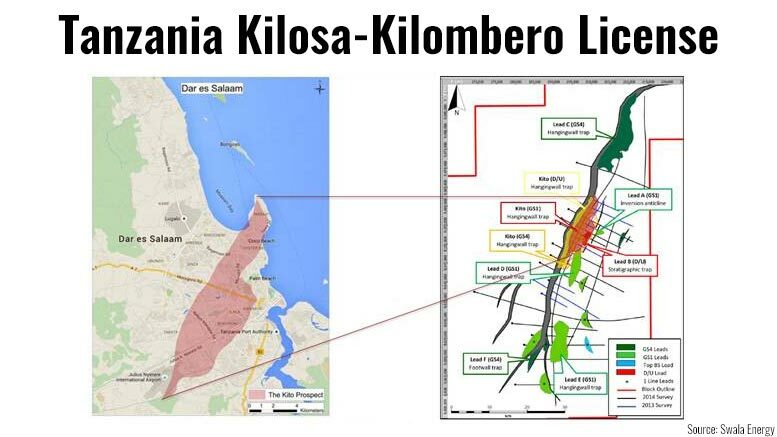 The Kilosa-Kilombero license covers an area of 17,675km2, located on the East African Rift System (EARS), which is a proven oil trend, Swala indicates. Swala is the operator with 25% interest in the license; 50% are held by Otto Energy and the remaining 25% are held by Tata Petrodyne. Swala is a subsidiary of, and is supported by, Swala Energy Limited, a public company listed on the Australian Securities Exchange (ASX:SWE). Oil exploration in Tanzania began in the 1950s and since then 23 deep test wells have been drilled and more than 30,000 line kilometers of seismic lines recorded. Although no oil has yet been discovered, one of the wells drilled in 1984 encountered an oil source rock, and surface oil seeps have been observed both in the coastal basin and in the western rift valley. Currently, 116,580 square kilometers of the country is under license, representing about 55% of the total area covered by potential petroleum basins. 14 exploration and development licenses are currently covering 5 different areas across Tanzania. However, no oil discovery has been made yet. Oil discoveries in Uganda’s Lake Albert region have led many oil exploration companies to begin looking at the possibility of oil in Tanzania’s Lake Rukwa basin via Lake Tanganyika in the western branch of the Rift Valley. Included in these exploration companies are the Norwegian-based Statoil Exploration Company as well as the Brazilian company, Petrobrus, both of which are involved in oil exploration projects in Tanzania.